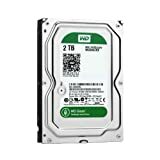 Amazon has the WD green 2TB desktop hard drive: 3.5-inch, sata 6 Gb/s, IntelliPower, 64MB cache WD20EZRX for $78 with free shipping. Sells for $81+ Highest Price. Deals for $67 Lowest Price. Normally $77+.